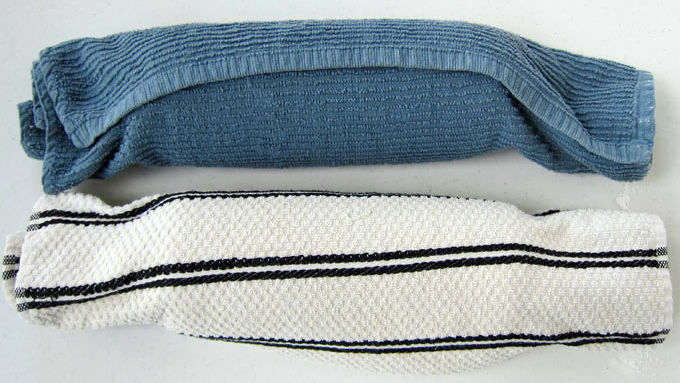 Preheat oven to 375° F. Line two 9x13-inch baking pans with non-stick tinfoil or parchment paper. In a large mixing bowl, beat eggs with an electric mixer on high speed until thick and lemon-colored, about 6 minutes. Add cake mix, apple pie spice, milk, and oil. Beat on low speed for 30 seconds, then on medium speed for 1 minute. Spread half of the batter into each of the two pans. Bake for 12-14 minutes until the tops of the cakes begin to brown. To tell if the cake is done, press a finger on top of the cake—it should spring back. Dust Kitchen Towels: While the cakes are baking, sprinkle 1/2 cup powdered sugar over 2 clean kitchen towels (1/4 cup on each). 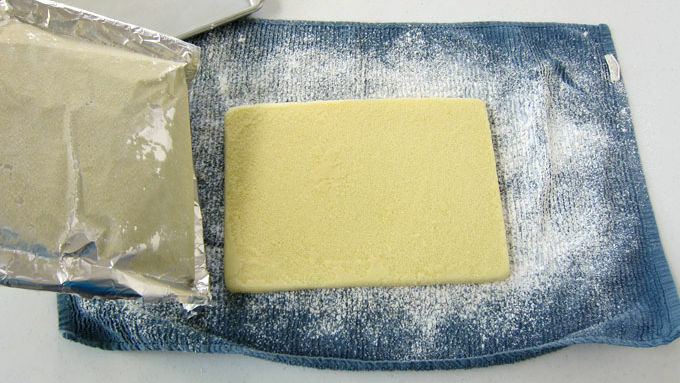 Remove cakes from oven and immediately flip one onto each kitchen towel. Peel away tin foil or parchment paper. 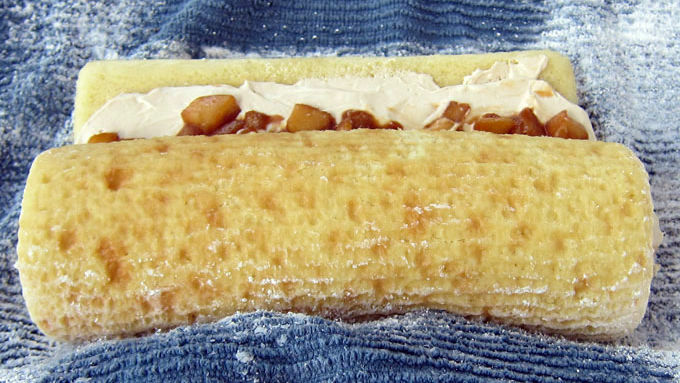 While cake is still hot, carefully roll up cake and towel from narrow end. Allow cake to cool completely while wrapped in towel. CARAMEL APPLE & CREAM CHEESE FLUFF FILLING: Toss apple pieces with lemon juice and set aside. In a skillet, melt butter over medium heat. Add brown sugar. Stir constantly until it begins to dissolve. Add apples and apple pie spice and toss to coat. Continue to stir until sugar completely dissolves. 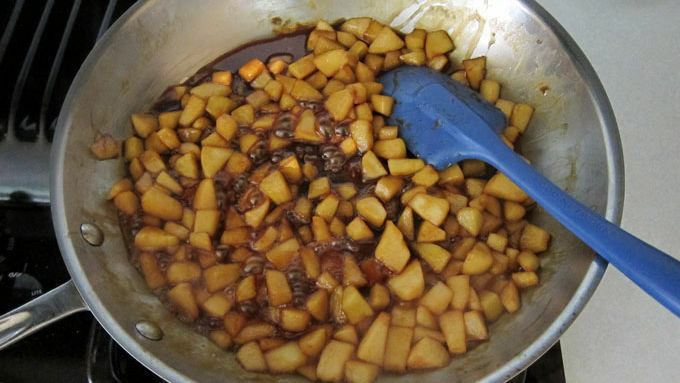 Reduce heat to low and let apples simmer for 4-6 minutes, stirring occasionally. Cook until tender and the liquid thickens. 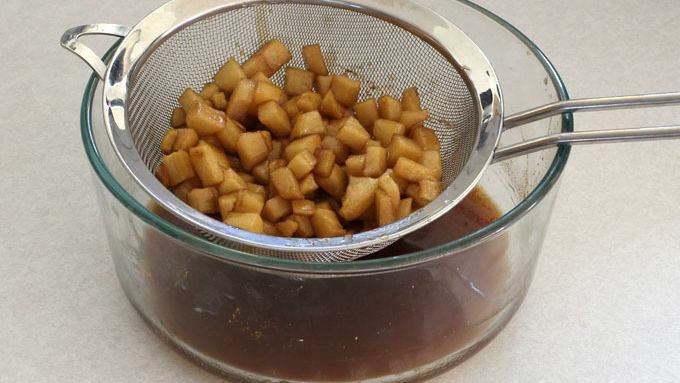 Remove apples from heat and pour them into a fine mesh strainer or colander set over a bowl. Let drain and cool for 15 minutes. 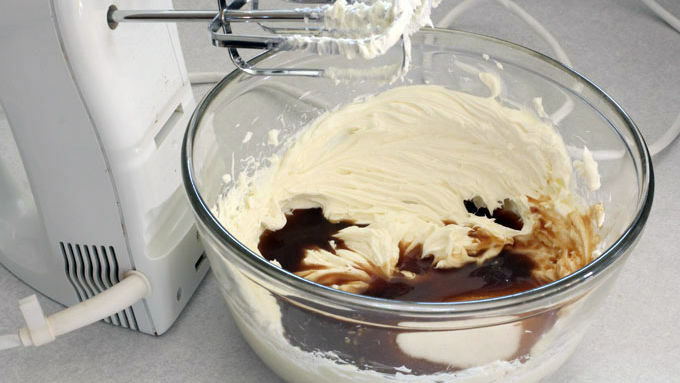 In mixing bowl and with electric mixer, beat softened cream cheese until light and fluffy. Beat in the sugar and the liquid drained from the cooked apples. Mix until sugar dissolves. Add the whipped topping and beat until fully incorporated. 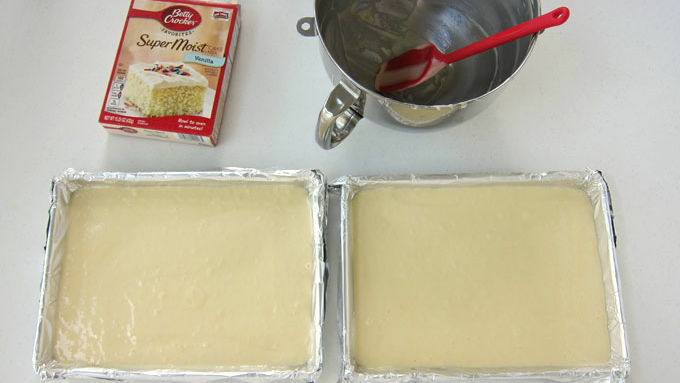 ASSEMBLE CAKES: Unroll cooled cakes. Spread half of the cream cheese fluff over each cake. Reserve 1/3 cup of the apples, then equally divide the remaining apples and spread them over the cakes. Roll cakes up into logs. Sprinkle cakes with powdered sugar. Set cakes on serving plates. Drizzle with caramel sauce and sprinkle reserved apples over top. When ready to serve, cut cakes into 8 slices. 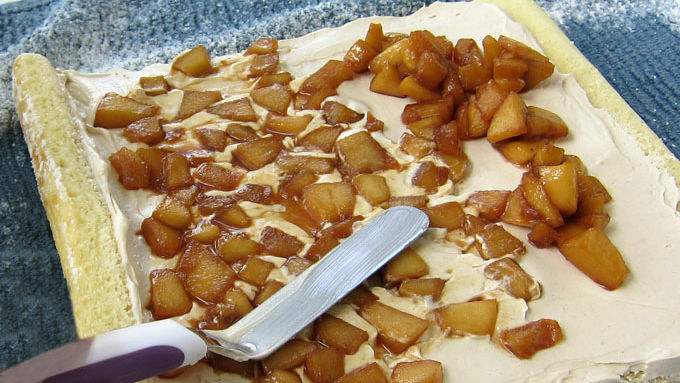 Go pick some fresh apples, because you’re going to want to make this dessert! 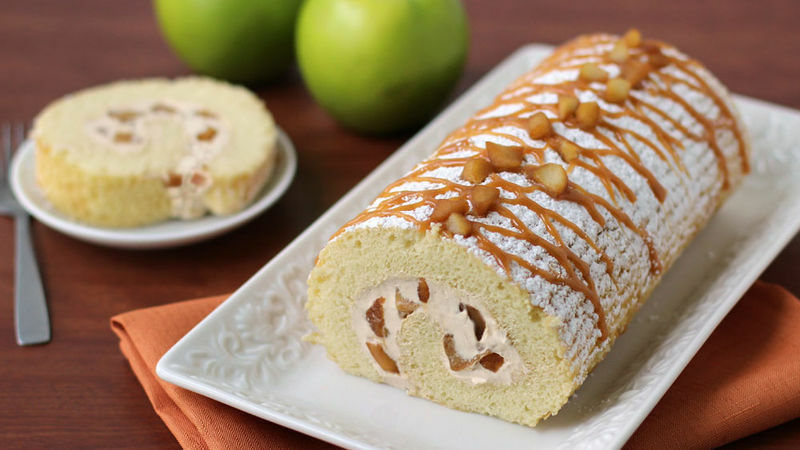 This Caramel Apple Cake Roll combines all the wonderful flavors of a no-bake cheesecake with caramel apple pie—and it's all rolled up in a moist vanilla cake. Each slice reveals a swirl of cream cheese fluff flavored with apple-infused caramel sauce, speckled with glazed apple bits, and dusted with sweet powdered sugar and more caramel sauce to make it even more indulgent. This dessert looks super impressive but is reasonably easy to make. When you’re ready to serve, cut the cakes into 8 slices. Enjoy!